the mound is a cupcake iced with chocolate icing and crushed chocolate biscuits all over it. 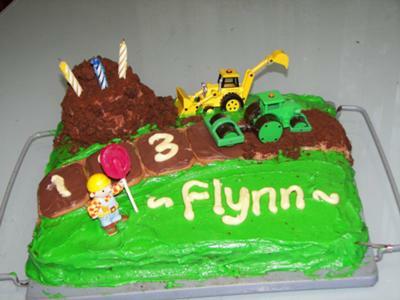 I iced 123 on the biscuits as it was his 3rd birthday and his name on the grass. I used the bob the builder machines that I had already and the bob creature I added a lollipop to look like a sign. It was a great hit with the kids. I agree with Nancy! Great job!!!! !